The big four banks in Australia increased their personal customers (aged over 14) by 1,042,000 from July 2011 to July 2015. This is an increase of 5.5% and is above the population growth over the same period (5.2%), indicating that they are retaining their dominant market position despite strong competition. These are the latest figures from Roy Morgan Single with over 50,000 interviews per year. 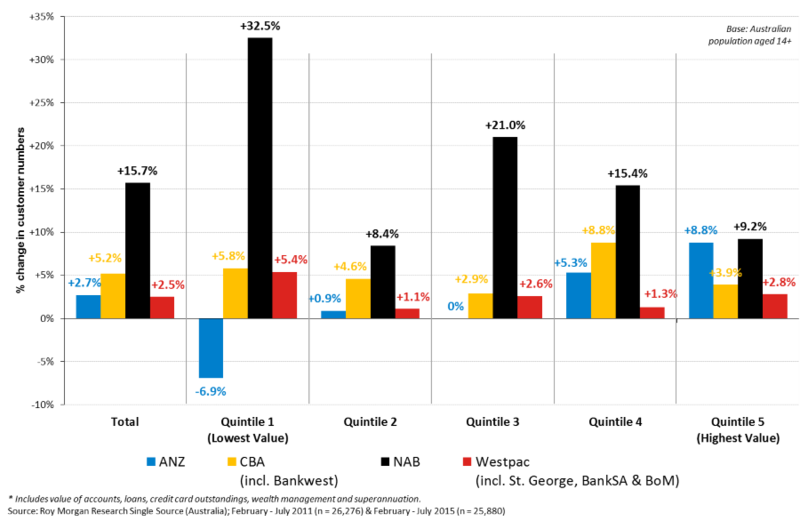 Among the big four, the NAB growth in personal customers growth over the last four years was 15.7%, followed by the CBA (including BankWest) with 5.2%, ANZ (2.7%) and Westpac (including the St George Group) on 2.5%. In addition to looking at the growth in customer numbers, it is important to understand the potential value of the segments in which the growth is occurring. In order to do this we have analysed gains in terms of segments based on the total financial footings (or value) that customers hold across all financial products and institutions. These products include all loans, amounts outstanding on cards, accounts, wealth management and superannuation. The segments have been produced by dividing the population into quintiles to represent five equal groups. Clearly the most important segment in terms of dollars is the top quintile (quintile 5) which accounts for only 20% of the population but it represents nearly two- thirds (63%) of the total market value (footings) of financial services. The biggest increase in customer numbers in the top quintile since 2011 was by the NAB with 9.2%, closely followed by the ANZ (up 8.8%). The other major segment (quintile 4) accounts for just on a quarter (24.7%) of the total market value of the financial services market. All four banks showed gains in this segment, with the highest being the NAB (up 15.4%), followed by the CBA (up 8.8%). In contrast to these high value customers, the lowest value quintile account for less than 1% of total market value (0.3%) and as such represents very little current potential although some may increase in the future. In this segment the NAB showed the greatest growth (up 32.5%), followed by the CBA (up 5.8%) and Westpac (up 5.4%). “The big four banks have been successful at increasing customer numbers but the issue now is how to grow the customer base in the areas with the greatest profit potential. “The strong NAB result in terms of customer growth is likely to be as a result of the “ break-up” campaign that started in 2011 with a combination of cutting fees,aggressive home lending and focus on improving customer satisfaction which had been lagging well behind their peers. Since that date, customer satisfaction increased to rival the big four leader, the CBA. We have seen that this campaign appears to have increased customer numbers across all segments but with the greatest growth being in the lowest value segment ( probably as a result of reduced fees ), this represents a potential issue for customer profitability.